The 4140 Box Newel makes every detail count. This 4 ¾” square box newel is carefully mitred at each edge, leaving no end-grain exposed. 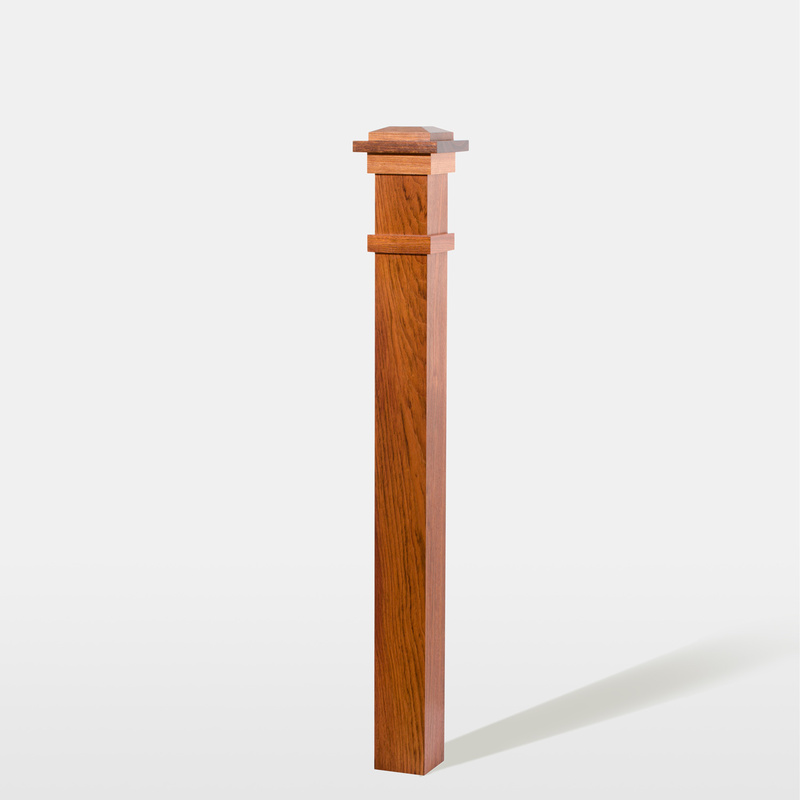 Simple shoulder trim and your choice of beveled or flat cap add to the classic beauty of the 4140 Box Newel. Craftsman style through-and-through, you are sure to enjoy the strength and style of this newel for decades. To install your 4140 Box Newel, you will need the Box Newel Mounting Kit. Follow our Installation Video to ensure a secure fit. The Box Newel may be installed either on the surface of the stair tread or beside the tread. Due to their precise edges, we have found that Box Newels look best on a square starting step. Join handrail to your 4140 Box Newel using a rail bolt kit. Many configurations allow handrail to mount directly into the newel; however, if your handrail is joining with your box newel on a rake, you may also require a gooseneck handrail attachment. I apologize, that’s an oversight on my part. This newel is available split, you can order it that way over the phone. Or order online and add a note about splitting. There is a $35 charge to split the newel. I would like to wrap this around the end of a 2.5″ knee wall. If this is a hollow newel, how thick are the boards at the base? This newel is hollow, and each board is 3/4″ thick. So, the opening inside the newel is 3 1/4″ x 3 1/4″. Let us know if you have any other questions. You can install it just like you would on a level surface, by using our Box Newel Mounting Kit. The only difference is that you’d want to cut the mounting kit at an angle to allow it to sit at the correct angle on the kneewall. Please let us know if you have any other questions. can these be cut down? We have 38″ ballisters and I think they might be a bit tall. How difficult would it be to cut them down 6 inches? These can definitely be cut down! 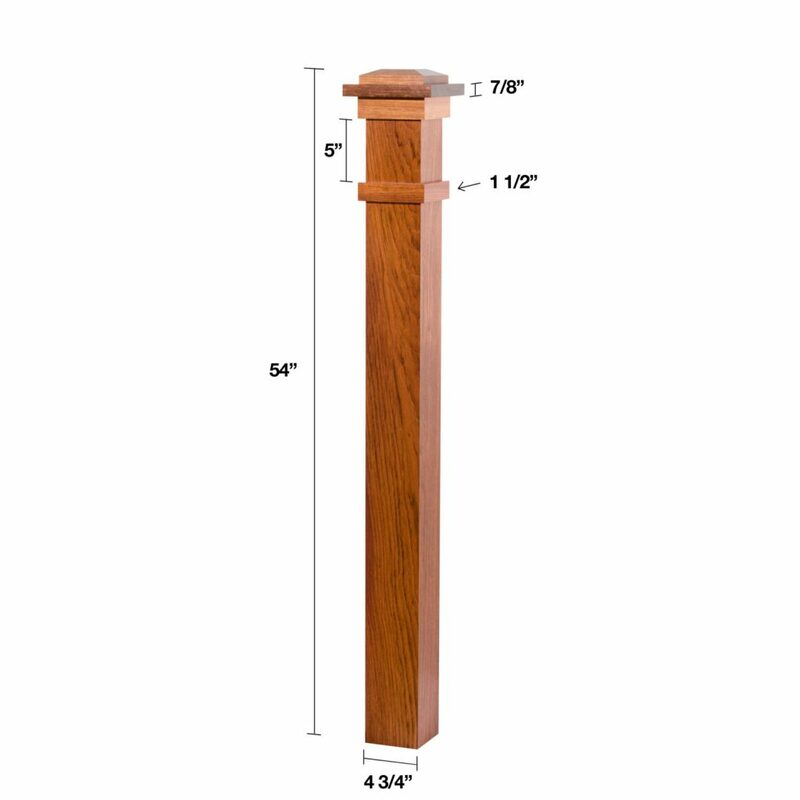 Because they are one size the entire length of the newel, they are easy to cut down on the job site. Are your Hickory newels made from one piece of hickory or 1″ strips glued together? Thank you for contacting us, Laurie. Our 4140 Box Newels are designed to be hollow. Each side (or face) of the newel is made of a single, solid piece of wood, mitered, and glued to form the finished newel. We are hopeful that this has answered your question, but if not, please feel free to contact us directly at custserv@stairsupplies.com. What is the best way to secure the cap to the post? Nailing from the center top square from the cap, Nailing from the side of the post, glue, or some other way? Because the inside is hollow, we have run into a predicament of which is the best way. Thank you for your question, Melissa. We would suggest a combination of gluing and utilizing finishing nails if you feel additional securing is required. Can I order this Newel be cut down to a height so the handrail will be centered in the correct location on the newel and be at 36″ to top of rail? I ‘m estimating approximately 41 – 42″ total Newel height? Thank you for contacting us, Jeff. I apologize for the delayed response. Typically, our box newels are made to the ordered height and trimmed to the exact need on site during installation. Can this newel (or even any of your other hollow box newels) be used like a sleeve and slid over an older colonial type 3″ base/top newel with the round ball on top? I’m assuming that’s why the opening is 3-1/4 x 3-1/4? Theoretically yes. You would want to make sure to add the additional 1/4″ of materiel around the existing post so that it’s a snug fit. In addition, you might need to cut a portion of the newel off to get to the desired height. I would like to install this newell over a knee wall that is wider than 3 1/2″. Can you make the newell so it fits over a 3 3/4″ wall? We can manufacture this at whatever size you need. Pricing will vary based on how much extra material is needed to complete your order. Please call in with your request, and we can get everything put together in a quotation for you. Let us know if there’s anything else we can help you with! Can you make these with the trim/cap a different kind of wood than the post itself? We can do custom orders if you call us at (866) 226 6536. As long as the two species of wood are species that we carry in stock, there shouldn’t be any problem. We can often create custom newels, but you would have to call us at (866) 226 6536 and talk to one of our specialists about the exact specifications you need.